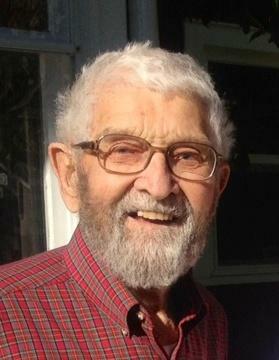 Creston, Ohio – Ben A. Romich, Jr., 93, died Tuesday, October 1, 2013, after enjoying an active life. Ben was born May 4, 1920, in Creston, Ohio to Katherine (Ault) and Ben Romich, Sr. He graduated from Creston High School in 1938 and lived in Creston his entire life. Ben married Marian Koontz on December 29, 1942. The couple celebrated their 68th wedding anniversary before her death in 2011. They enjoyed camping when their children were young and traveled extensively together in their later years, including a trip to the UK. For his working life, Ben was a farmer in partnership with Gene McKelvey, his late brother-in-law. He also served the community as a village councilman and volunteer fireman. He was an active member of the Creston Presbyterian Church, the Creston Historical Society, and supported other organizations including Habitat for Humanity, the Wayne County Historical Society, the Junior Fair program and Goodwill Industries. Ben had a life-long interest in things mechanical and had an exceptional ability to make and repair a wide range of things in his shop. His skills made him a valuable resource to the local community and he touched many lives in this way. He was an avid collector of early gasoline engines and built many steam and Stirling cycle engine models. Ben is survived by his sister Shirley McKelvey of Creston; four children, Barry of Wooster, Tom of New York City, Lynn (Art) Hershberger of Wooster, and Philip (Beth) Romich of Wadsworth; grandchildren Jennie, Katie, Andrew, Todd, Joshua, and Hannah. Visiting hours are Friday 4 - 8 p.m. at Murray Funeral Home (173 South Main St., Creston). The funeral is Saturday at 11 a.m. at the Creston Presbyterian Church (13070 Cleveland Road, Creston). Memorials may be made to Creston Presbyterian Church or to an organization of your choice in Ben’s name. The above photo was taken on the occasion of the celebration of life of Ben's late wife Marian. More photos and stories will be posted here soon.